How to break a bad habit and create an amazing one! 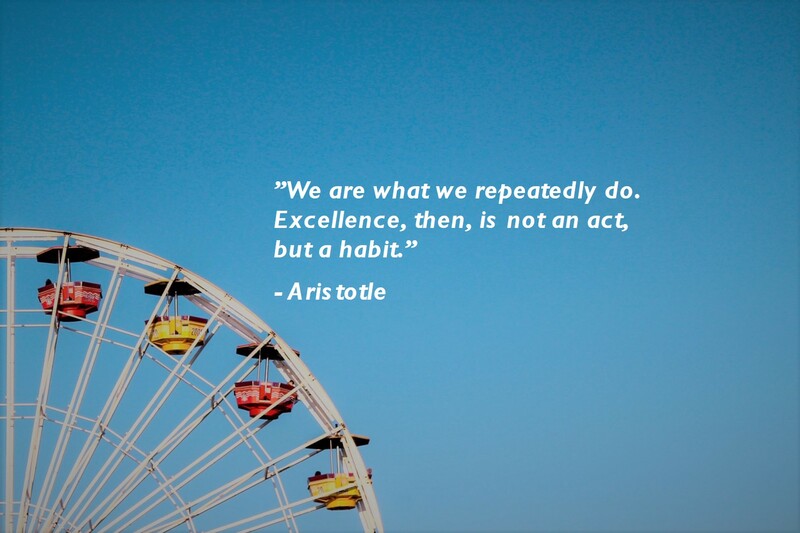 Habits can be amazing – if they are great habits! Habits are the things that we do again and again without really thinking about why or how we do them. We have managed to ingrain these habits so deep into our subconscious mind that we just do them without thinking. They also have a massive impact on our lives as they just get done automatically. The significant question we all have to ask ourselves is: is it a great habit or a bad habit (or even disastrous one)? Without continuous reflections we might get stuck with a lot of habits that not really work in our favor towards a life on our terms…..
What’s the “problem” with habits? If we always do what we have always done, we will get what we have always gotten. Most of what we do by routine, have become our habits and we just do them because they have become “easy” to do and now form part of our lives. We might have the habit of always investing (great!) in mutual funds for our pension. But if we just do it and never review why, what and how we do it, we might lose a lot of money. We might not realize that we perhaps have chosen the “wrong ones” or that we might be paying 50% away in fees! It is just another habit, that just happens automatically! Had we reviewed this habit, perhaps we would have realized that there was a much better way to create financial security or even freedom! The challenge with habits is the way they work, that they are automatic. So as soon as we are exposed to the trigger, we automatically apply our “routine action” because we want the “reward” or stimuli (similar to Pavlov’s dogs). This deeply ingrained response is very tricky to just quit. We all know it is a bad habit to smoke, drink, eat unhealthy food, not exercise etc., but we do it anyway. A bad habit seems to be easy to form (maybe because it is related to certain stimuli that large corporations make us addicted to, as with sugar and other additives), whilst a good habit is harder to form. My personal view on why some of our habits are so hard to break (besides from them being ingrained into our subconscious mind) is based on the fact that the dopamine highs are so easy to get today. Hence very few people have the mental strength to get them the “harder way” even if the end result (not just the dopamine kick) would be so much better for us and our lives over the long-term. Check out my post here on how to Start Gaining Momentum. In essence, having habits and never really think and reflect about how and why we have them can be disastrous to our health, finances, productivity and happiness!! What are the advantages of habits? If they are great habits, it is amazing to have them. I want to have loads of great habits because then I will get the result I want much faster. Just imagine the amazing benefits of making great things happening for us and to us all the time, without even having to think about it. We don’t even have to spend any decision-making capacity on it, it will just happen! This is one of the main reasons why I am super keen on making sure that as much as possible of the processes, techniques and tools on this site become habits for you (and me:))! Once they are there and things just happen without having to spend brain power on them. Exercising just happens without inner discussion/conflicts as it’s a habit, it just gets done! The momentum we get by having great habits like our morning routines, evening routines, Daily Focus routine etc. is insane and it takes no willpower! Living an amazing life where most of the stuff that used to be hard or boring to do, have now been automated/habitual is an amazing thing. Make sure you set yourself up for success by creating great habits too! Habits are tricky to break (ask any smoker) as it requires a lot of willpower. The alternative is to replace a bad habit with something else which still gives you the same stimuli or reward. This might be tricky and of course, the first thing is to be aware of the bad habit. Then finding the trigger for it and what it really is that you want (reward). When you know, you can find something to replace it with which gives you the same feeling. What is the trigger? – Often it is boredom, not that we are hungry. What is the action we take? – To eat something. What is the reward? – Less bored as we get another stimuli. This bad habit could instead be changed to another one by acknowledging when we get bored (the trigger) and get the stimuli in a different way than eating. We could engage in something we enjoy, like listening to an interesting podcast. The reward would be that we feel good about having gained new knowledge. Guess what, most likely we have not thought about food as we were not hungry in the first place, just bored! With a bit of awareness, a new habit has just been formed :)! The other good thing is that willpower is like a muscle which can be trained to make you do certain things even if they seem hard at first. Check out this post on how Creating a Winning Mindset. If you use your willpower to decide in ADVANCE what you will do, you will not have to think about it later as you have already made up your mind and this is key!! Find the KEY habit to replace or introduce! If you have read my post on the 80/20 rule, you know exactly what I am going to talk about, if not, read it here. We all have numerous habits and some are good and some are bad. What we need to figure out is which one we can either change or implement and that will have a snowball effect and create other great habits! Based on my experience, exercise is one of those, if not THE key habit of all. I would say it is the holy grail within habits as it affects us so profoundly at so many levels. By creating a habit of daily exercising and pushing yourself, you are training your brain at the same time. Every time you push yourself when exercising, you are gaining mental strength which will always be useful. I am not saying that you should run a marathon tomorrow, but think about the consequences of being in better shape physically (and mentally). You can do anything – your physical shape will never stop you from doing anything! These are just a few of the benefits I get from exercising and to me they are all great motivators. If you start looking good physically, you will most likely improve your eating habits which will make you feel even better. When you realize that your mind is now much more switched on and “awake” you will improve your eating habits even further. Now you feel super sharp so starting to take control over you finances is not such a big burden and you know that the benefits will be significant. You have trained your body and mind so you now have the willpower to get started and finish it! Because of all the energy you get from exercising, you start getting up earlier in the morning doing your morning routines and you realize that most of the days, you are no longer stressed. You are in control of your days, you become happier and more joyful and feel better about your life and your future. This is what happens, and if it doesn’t happen to you, it is just because you don’t have a big enough WHY so you are not committed enough. Check out this post on why you need to know and have a Burning Desire. If you find it hard, I recommend you to start here and just follow the process and if you do, you will for sure be successful! Find the KEY habit and either replace or create it! One step with a lot of leverage means massive result very fast. Use that to catapult you to a life on your terms!